“Doubt as an Integral Part of Calling: The Qur’anic Story of Joseph. ” In Hearing Vocation Differently: Meaning, Purpose and Identity in the Multi-Faith Academy edited by David Cunningham, Oxford; Oxford University Press, 2019. “Disciples as Companions: Ibn Taymiyya’s and Ibn Qayyim’s Evaluation of the Transmission of the Bible.” Medieval Encounters 24, (2018): 530-60. “Remembering the Umm al-walad: Ibn Kathir’s Treatise on the Concubine Mother.” In Concubines and Courtesans: Women and Slavery in Islamic History edited by Matthew Gordon and Kathryn Hains, 297-323, Oxford; Oxford University Press, 2017. “‘The Slave Girl Gives Birth to Her Master’: Female Slavery from the Mamluk Era (1250–1517) to the Islamic State (2014– ). ” Journal of the American Academy of Religion 85, no. 4 (2017): 1–23. “Ibn Taymiyya as Exegete: Moses’ Father-in-Law and the Messengers in Sūrat Yā Sīn.” Journal of Qur’anic Studies 19, no.1 (2017): 39–71. “Jews, Christians, and Muslims: People of the Book.” Anselm Companions to the Bible, ed. Corrine L. Carvalho, pages 100-118. “Was Ibn Kathir the Spokesperson for Ibn Taymiyya? Jonah as a Prophet of Obedience,” Journal of Qur’anic Studies 16, no. 1 (2014): 1-19. 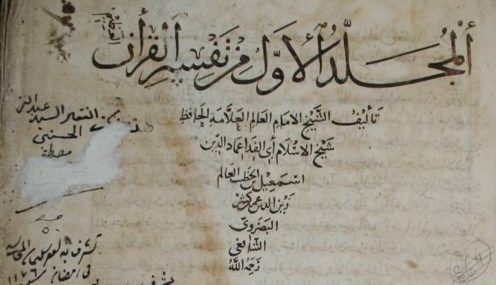 “Ishmael as Abraham’s Sacrifice: Ibn Taymiyya and Ibn Kathīr on the Intended Victim,” Islam and Christian–Muslim Relations 24, no. 3 (2013): 277-298. “Abraham as an Iconoclast: Understanding the Destruction of ‘Images’ through Qur’anic Exegesis.” Islam and Christian-Muslim Relations 16, no. 4, (2005): 413-428.